This article is about the theme. You may be looking for LEGO Racers (Game). LEGO Racers is a popular LEGO Theme that was first announced to the public in 2001. It is the successor of LEGO Race, and its first subtheme was Xalax. Since 2002, most race cars in LEGO System and TECHNIC universe (including Radio Control race cars) have been released under the LEGO Racers theme. Different subthemes have been developed including Drome Racers, Tiny Turbos and Power Racers, as have licensed subthemes, such as Williams F1, Ferrari and Lamborghini. Many Racers sets do not contain Minifigures; special Minifigures were included in sets from 2002, 2003, and some Williams F1 and Ferrari sets. Minifigures are also included in the 2012 sets. Promotional sets usually include Tiny Turbos. 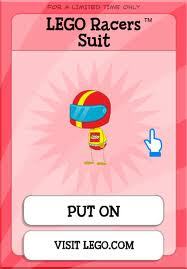 A Racers suit in Poptropica. Drome Racers, while under development, was known as LEGO Racers 3. A fourth game, LEGO Racers 4, was in development by ATD and was to feature large, streaming worlds, but was canceled. In 2004, another game, LEGO Racers CC, was advertised in some catalogs, but was never released. In 2007, a mobile game simply titled LEGO Racers was developed by Kiloo and published by Hands On Mobile. Boxes for 2009 Racers sets advertised a game called "LEGO Racers: The Video Game", but this game was presumably canceled. This page was last edited on 12 January 2016, at 23:41.